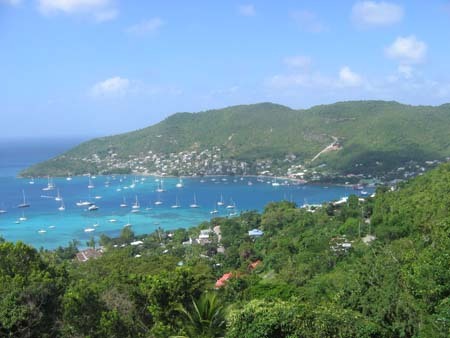 Bequia is an old whaling port and its locals have "aboriginal" rights to take whales by hand thrown harpoon as they learned from their Scotch ancestors. 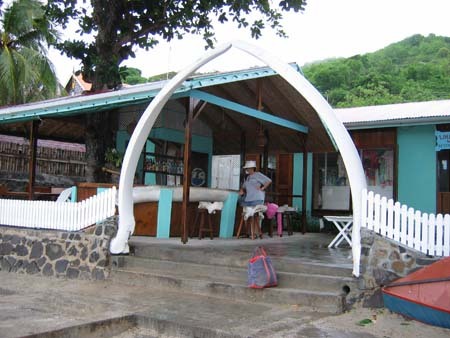 The old whaling station is around the corner on Petite Nevis which also has great snorkeling but is basically a day stop. The Ex-pat community is very tight and there are a great number of quite advanced services in the main anchorage at Admiralty Bay. There are still boat builders here, many of whom are building the local race boats or who have turned to model boat building. There is a fine Customs building and this is a good place to check into and out of SVG. 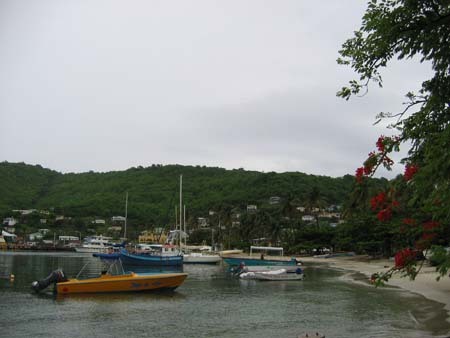 The small vegetable market and fish market (as well as a garbage dump) is at the smaller jetty to the north of the big commercial dock at the eastern end of the bay. Daffodil runs a thriving business supplying boats with fuel and water from barges and you can get any foodstuff you want at Doris's. If you want it, she's got it, but the prices aren't marked and you can run through EC pretty fast. Several local groceries (Knight's Trading, Euro Shopper) are stocked with a more limited selection of exotic foods but at reasonable prices. 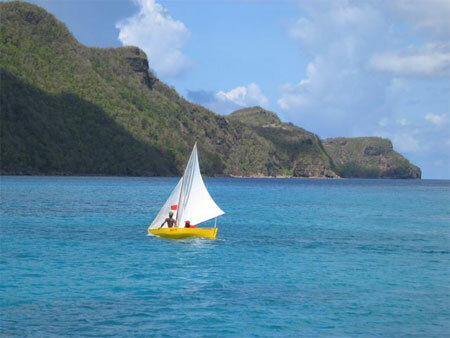 If Bequia gets too hectic, you can always move around to Friendship Bay on the southern side for peace and quiet. 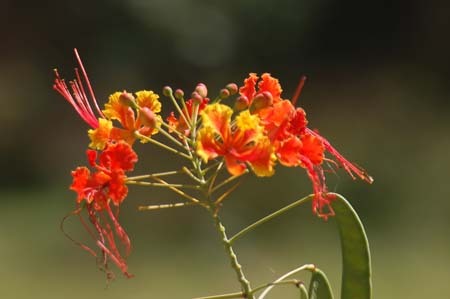 Frangipani hotel, Gingerbread House and Whalebone Bars and Restaurants run along the south shore at the top of the bay and offer internet, expresso! , good food and a dinghy dock. The bar, stools and entry are made of whale bones. Industry Bay A nice walk runs past here to the Turtle Sanctuary. 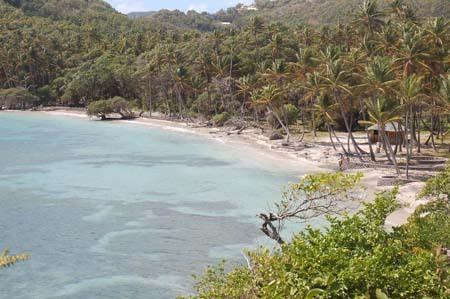 At left is industry bay on the Eastern side of Bequia. Moonhole, a wierd collection of all stone buildings and the turtle sanctuary are the two big tourist attractions on the island. We have never coughed up the big bucks required to visit Moonhole but those who have, say it is well worth it. 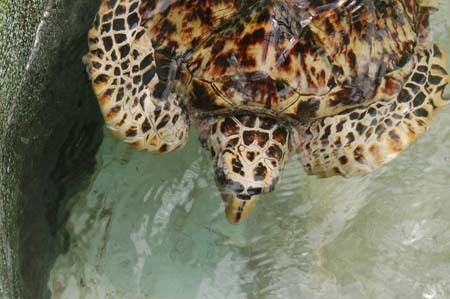 The turtle sanctuary is a great place to visit, a worthy cause and a lovely walk. Take a taxi back.